New Delhi: Completing its seven years of incorporation this year, the Biotechnology Industry Research Assistance Council (BIRAC) will be celebrating the success of its journey so far on 19th and 20th March 2019 at New Delhi. The event that is themed, “Nurturing Innovations: Empowering India,” will witness deliberations over the current opportunities in the biotech innovation ecosystem and boosting them further to make India globally competitive in the biotech sector. Dr Rajiv Kumar, Vice Chairman, NITI Aayog, will be the chief guest on the occasion. The other top dignitaries who would be addressing at the event include the Secretary of Department of Biotechnology (DBT) and Chairperson, BIRAC, Dr Renu Swarup and Dr Ted Bianco, Former Director, Wellcome Trust, UK who will deliver the BIRAC Foundation Day lecture. Dr Mohd Aslam, Managing Director, BIRAC will address the inaugural programme followed by the other top dignitaries. The first day will witness the presentation of SoCH awards and BIRAC TiE-WInER Awards under the anchored and announced by Dr Manish Diwan, Head (SPED) at BIRAC. It will be followed by the release of BIRAC publications product launch by the Chief Guest. Vote of thanks will be delivered by Dr Shirshendu Mukherjee, Mission Director, PMU-BMGF. Besides the inauguration of Innovator’s Exhibition by the chief guest, Dr Rajeev Kumar, the another feature of the first day would be a special plenary lecture by Dr Chris Karp, Director, Discovery and Translational Sciences, Bill & Melinda Gates Foundation. The 2nd day of the event on 20th March will host a special session on Women Entrepreneurship titled “Biotech powered Women entrepreneurs creating Regional and Global solutions: Vigyan Se Vikas”. The high-level representation from the participating countries is expected to provide an opportunity for need identification, roadmap creation and networking to facilitate women entrepreneurship in partnering nations. At the sane time, the BIRAC and DBT are looking at facilitating as a potential knowledge partner to implement and replicate strategic activities in the partnering countries. Another session in the second half will focus on products & technologies supported by BIRAC and pull from Stakeholders. It will witness the outcome oriented interaction between stakeholders and BIRAC supported commercialized startups to facilitate their next level engagement. This session moderated by Dr Manish Diwan, Head – SPED, BIRAC. The BIRAC’s 7th Foundation Day event is expected to be an excellent opportunity to explore new partnerships and leverage existing strengths to build the enterprise. For many who have been associated with the organization directly or indirectly, it surely will be a moment of nostalgia and pride. Since its foundation in March 2012, the BIRAC has set its footprints across India and at all major global biotech destinations. BIRAC has over 10 flagship schemes that are supported by funding from the Department of Biotechnology and manages 7 collaboratively funded programs with international partners, such as the Bill & Melinda Gates Foundation, Nesta, the Wellcome Trust and USAID, among others. BIRAC tries to galvanize the social impact by piloting research and extension services within a series of thematic calls and other global definite initiatives to improve public health and beyond. There are more than 15 agencies both national and international who are BIRAC partners for implementing the various activities, nearly 700 national experts from academia, industry, public and private research laboratories and government/ministries department who are involved as experts and resource persons and facilitate the decision-making and monitoring of BIRAC activities. BIRAC is also playing an important role in the recently announced Startup India Action Plan for promoting the Biotech Innovation Ecosystem. BIRAC has supported 25 Bioincubators and 2 Regional Centres for Entrepreneurship Development. The innovation and startup support has resulted in more than 100 technologies and products at different stages of commercialization. 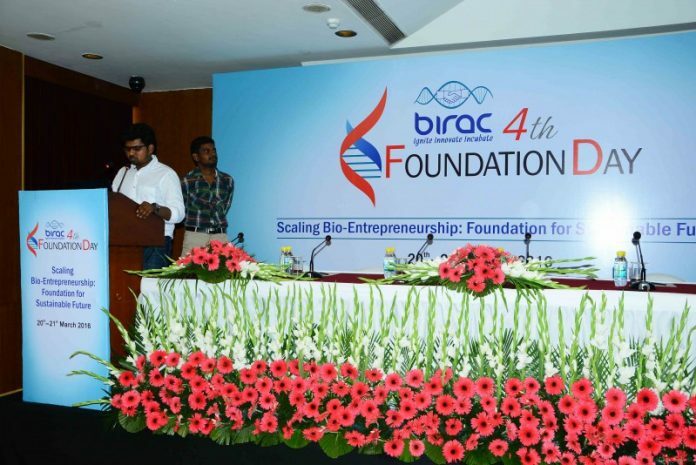 Being the first of its kind organization in the biotech sector, BIRAC has surely made some impact on the innovation landscape which is clearly visible in terms of swelling numbers of innovators and startups.